I keep writing in the hopes this message gets out. We had a successful open house at the Clear Spring School despite terrible rain throughout the day. Last night the rain continued with flash flood warnings throughout Northwest Arkansas and Southwest Missouri. My wife and I live on a mountaintop, but many of our friends do not, and we could not help but worry for their safety. The severity and duration of the storm was such that I have never experienced anything of its kind before. If global warming is a conspiracy by the Chinese, as Donald J. Trump claimed throughout his campaign, I'd say they've gotten good at it. And they're likely to get better at it while the world gets worse. We live in a forest with trees adapted to the climate in which we've live, and so serious climate change can put all in the world around us at risk. Today we have our Wisdom of the Hands Fundraising event. You are welcome to contribute by using this link. I keep writing in the hopes that my message reaches out, and that it becomes refined to an irresistible essence. Unfortunately, people have a very difficult time understanding that which they have not experienced first hand. Seeing a thing or two on YouTube is not the same as having taken materials and tools into one's own hands. In order to capture children's imaginations, they must be encouraged to do real stuff and the same applies to the adults among us. The engagement of the hands is a measure of reality, and the whole body reacts to learning when it is allowed to. This a link to a review I wrote in 2009 of Matt Crawford's Book Shop Class as Soulcraft. 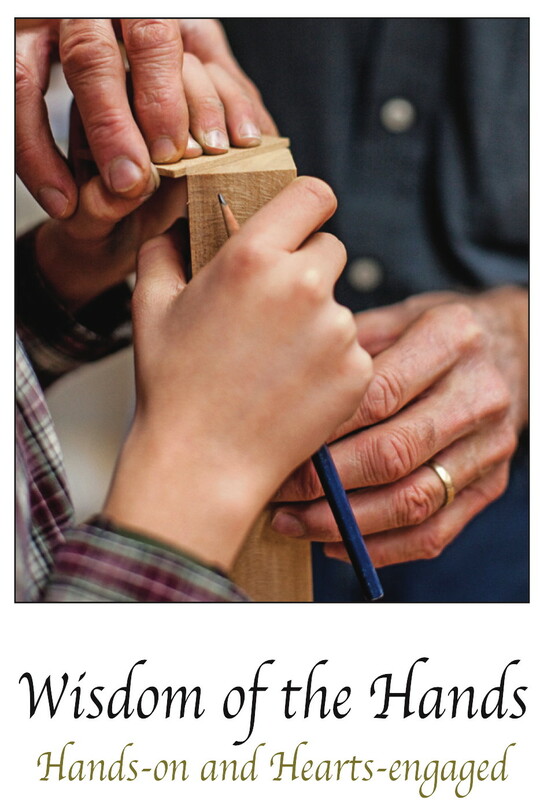 At today's fundraiser, two of my students will be teaching adults to make things from wood. The photo above as taken by Arshia Khan for Arkansas Life Magazine. Trump's budget and the arts. Trump's proposed budget severely cuts funding for the arts at a time in which arts comprehension and student ability in the arts have already been severely curtailed by standardized testing and excessive pressures on testable subject areas. American teenagers are not excelling in the arts, and President Donald Trump’s proposed budget cuts will likely make matters worse, experts say. The most recent results of a wide-ranging national educational assessment known as the Nation’s Report Card left significant room for improvement in the visual arts and music, the National Center for Education Statistics reported Tuesday. Students scored an average 147 in music and 149 in visual arts on a scale of 300, dipping very slightly from 2008, when the test was last administered. A sample of 8,800 eighth-grade students from public and private schools participated in the 2016 National Assessment of American Progress, which evaluates comprehension based on a series of questions and original work. In the early days of manual arts training, some educators claimed that there was no time available to be wasted on such pursuits as the manual arts. Manual arts advocates argued that the academics could be learned in less time if invigorated by manual arts studies. Who you think was right? In the meantime, education secretary Betsy DeVos and conservatives in congress are pushing for a vast increase in the number of charter schools to give parents "choice," through a system of vouchers. In a study of Washington DC schools, voucher system students in charter schools are performing less well. So much for that idea. Why don't policy makers learn and move on? Perhaps rigid adherence to belief is more important to them than reality. Children have an overwhelming need to do real things. To sequester them in the unreality of academic pursuits is to stifle their spirits as well as their curiosity. And yet the idiocy of educational policy makers persists. The seesaw that my elementary school students and I made continues to be their favorite thing on campus and they head for it in a beeline whenever they are let out for recess. They are learning things that will never show up on standardized tests, but will show up in life. Today, from 11AM to 2 PM, We have an open house at the Clear Spring School. You are welcome to attend. I am preparing for an open house at the Clear Spring School, tomorrow Saturday, April 29. You may come by to see the wood shop where my students work. On Sunday, April 30, we will hold a Wisdom of the Hands fundraising event. Yesterday the electricians were busy at the new ESSA wood shop, finishing the wiring. The carpenters are installing the wood paneling on the inside of the building, and we moved a SawStop table saw from storage into the building, the first piece of woodworking equipment to arrive on site. Sheet rock in the entry hall will be installed today. Work benches will arrive this coming week. And volunteers will begin preparing the shop for classes. Next week we will begin ordering new equipment and building various benches and router tables, using some of the materials we've been able to salvage from the construction process. May will be a busy month. With the end of the school year at Clear Spring School, and the opening of the new ESSA wood shop, I also have May Fine Arts Month to take some of my time. In addition to all that, my box guitar book is in the editorial process which means I'll likely have many questions to answer. But this is not a complaint. Our love affair with the computer has thrown everything out of whack. As the starting tool in so many young lives, the computer in all its forms is incredibly complex and abstract, is intended to make easy, and kids are learning to “do” things on it long before they know anything about a hammer or a knife. I put “do” in quotation marks because they give the appearance of doing things whereas most of the “doing” apparent on the screen was pre-engineered by software specialists to give the parents the sense that their children are “creative,” and the child the sense that they are in control. So the Educational sloyd principle of starting with the known and moving to the unknown requires us to rethink schooling. How do we start kids out on the computer and move them into real concrete studies and real results that offer meaning to family, community and self? It is rather perplexing. And many young parents and teacher will likely have difficulties reaching into the unfamiliar terrain of hands-on learning. Change can be made to come, however. While all the powers that be are trying to revolutionize education by putting more testing and top down control in place, we need to cut loose and put all learning back into the hands of kids. Teachers should be commanded to examine their own learning to assess what role their own hands had played in it and then be assessed on their effectiveness at putting their student’s hands at work in service to their learning. Make, fix, create, and increase the likelihood of others learning likewise. I made some progress on my post card for the Incredible Edible fundraising auction at the Eureka Springs School of the Arts in June. A number of local artists were invited to make postcards of their own design, and mine is being made of wood. I went to the post office yesterday to check to see if the ink they use to cancel stamps is effected by the Danish Oil finish I use. After I explained my mission, the clerk asked, "You are not going to really mail that are you?" My test proved that I can get the stamp cancelled first and then apply the Danish oil over their ink to provide a finish. Water based inks like that in a gel pen, or post office cancellation stamp go well with oil finishes, whereas solvent based inks, like that from a Sharpie will be carried by the oil finish into the surrounding wood. My elementary school students have continued making caped super heroes. Whether in first grade or in 6th, the enthusiasm has been the same. One first grader made two figures, batman and mom, as shown in the photo. (Facebook readers will have to go to the blog to see) For batman, he decided to use dowels for ears. Today I will begin moving the first of the equipment into the new wood shop at the Eureka Springs School of the Arts. We are having a Wisdom of the Hands fundraising reception in Eureka Springs on Sunday, April 30, from 3 to 5 PM. If you wish to attend, please RSVP at 479-253-7888 or by email. If you are unable to attend and wish to support the Wisdom of the Hands Program at the Clear Spring School, donations can be sent to Clear Spring School, PO Box 511, Eureka Springs, AR 72632, or by Paypal on the Clear Spring School website. So why would someone support a small woodworking program in a small school in a relatively small city in Northwest Arkansas? We are at the cutting edge of what education can be and had best become, and a relatively small investment is what keeps us moving forward. Today in the Clear Spring School wood shop, students will be making more super heroes, and other interesting things. I am also cleaning the shop for an open house on Saturday April 29. I have been working on laminated veneer post cards, one of which will be auctioned at the Incredible Edibles Art Show to support the Eureka Springs School of the Arts. Artists from among many supporters of ESSA are asked to make post cards that will be displayed and sold at the event. The first photo shows the layers of veneer held tightly to the form by the vacuum press as the glue dries. The laminated "card" will be shaped and sanded to a more interesting form. The mold for the "card" was sawn from a block of solid walnut. Yesterday we made caped action figures in wood shop, inspired by the student's study of "community helpers".... people who make our small city work for the benefit of all. I prepared for the lesson by making some caped action figures of my own. One is super librarian, made in honor of the librarians that keep our wonderful Carnegie Public Library in service to all readers. The second was in honor of Friedrich Froebel's Charcoal Maker. I read students the poem from Mother Play about the Charcoal Maker and told how the Charcoal maker, frighteningly covered in soot, served an important role in the community and deserved the childrens' respect. As the poem describes, the charcoal he made was essential to the blacksmith, and for keeping homes warm for the children inside. One student made a hospital worker as shown. Another made an action figure in honor of his step-father who is such an important influence in his life. I hope this lesson also helps my readers to understand a bit about how we plan projects. Making a model is essential in helping the teacher (me) to work out the process in advance and to provide a concrete example as the starting point of the child's labor and creativity. Their main teacher had laid the groundwork for this project by arranging field trips to visit a variety of helpers in our small community. For me to know what the students were doing in their classroom studies helped me to select a project that would be in context. The upper elementary students were so intrigued by what the younger students had made, they came into the wood shop saying, "I want to make one of those, too!" And so they did. Part of the inspiration for this project came from a tiny hand powered Singer sewing machine. I wanted the students to have something to sew, and a small cape provided a beginning project. The students had made wooden dolls earlier in the year so they already knew a bit about the processes for the wooden part of the project. Make, fix, create, and extend the opportunity for others to learn likewise. Yesterday I applied a first coat of Danish oil to several things I've made recently, including the tool chest shown in the photos here. It's a pleasure watching the wood change color as the finish is applied. It becomes darker and more reflective, and assures me that the object will be better protected in use. The cherry in this chest will darken to a richer red-brown from exposure to light. Months from now, the rest of the box (except for inside) will be the same dark color as the turned knob. The inside and the tray will darken too, but at a much slower rate unless I leave the box open part time, allowing the inside to catch up. My first, second and third grade students have been studying "community helpers." I am interested in having them make super-hero action figures complete with sewn capes, representing such important community helpers as our local librarians, teachers, mothers, and fire fighters. So this afternoon they will make wooden figures and learn to sew capes using the tiny Singer Model 20 sewing machine that I acquired for use in the class. Depending on how things work out, I may have photos of local action figures tomorrow. I expect it to be fun for me, and I hope it interests my kids. In order to prepare I'll make a few super hero models of my own. A favorite figure I plan to make is based on Froebel's "charcoal maker" illustrated in his book, Mother Play, or Mutter Und Kose Lieder. The charcoal maker at that time was someone Froebel's students would meet and be frightened of as he came from the forest looking wild and covered with soot. Froebel's song, illustration and finger play would tell the children he was no one to fear, but instead had an important part to play in the wholeness of life. I'll also make a librarian. I know some of my readers are interested in guidance for the selection of projects for kids to make. The first thing is to make whatever you plan to have them make yourself. This helps you to foresee any problems they might have with regard to holding stock or safe operation of tools. It also provides a model for them to follow. Allow your teaching to be organized not by models but by growing experience in the use of various tools. Salomon had devised a set of models, but most of his followers saw only the models, not the underlying exercises in the safe use of tools that he also described and upon which the models were based. His model series were systematically arranged according to a series of exercises that were to build the child's skill and understanding just as Froebel's gifts were to be systematically applied. At this point, having done what I do for so many years, my cupboards contain projects that we've done in the past. There are boats, toy cars, trains, puppets, boxes, tool boxes, and many practical things that kids can make. The kids see those things and want to make them (or not). But whether you've made something as an example for them to follow or be inspired by, or whether you've pulled something from the cupboard of things made in the past, a part of the theory of Educational Sloyd applies: Move from the concrete to the abstract. The point of Kindergarten as it was first invented, was to introduce the child to the wholeness of real life, not to get a leg up on the competition through increased emphasis on reading, standardized testing and academics. Educational Sloyd shared that original intent. Yesterday I sanded boxes to send to Appalachian Spring Gallery, and today I'll apply Danish Oil to a variety of projects that have been waiting for it. With my income these days being balanced between writing, teaching and making, the selling of work gets pushed to the back burner. In addition to oiling boxes, I'll take breaks to clean the wood shop at school, and to work on a product review and an article for Fine Woodworking. Unless I get distracted from all that. My daughter, teaching chemistry and physics in New York City, marched in the Science parade in New York, and her sign, acknowledging both her position as a teacher and the importance of science in all things, brought new friends. My own spirits are lifted by a generation that will sooner or later send us back in the right direction and reverse the efforts of the Trump administration. I hope we once again protect our air, water, lands and forests from corporate predation. Corporations are NOT people, have no soul, and must be controlled by regulations to prevent them from inflicting huge irreparable damage on the planet. My daughter alerted me to two new science tools. One is the origami microscope that can be bought for a dollar and that folds to fit your pocket. Another is the use of the button toy model to make a paper centrifuge or paperfuge. The seesaw that the students and I made at Clear Spring School continues to be the main attraction at recess. There are nearly always 4 students on at a time, with one or two standing by for a turn. Is it because they'd never seen seesaws before or because they had taken a hand in the making of it? I know the latter to be true. Make, fix, create, and enjoy helping others to learn likewise. I found it lovely to see some of my student's working represented in this important project. One of the questions that Scott asked me to answer in my interview had to do with the relationship between Educational Sloyd and the rising maker movement. My point was that the maker movement is a wonderful turn of events that would be enriched by an understanding of its place in the history of manual arts education. Makers have a sense that they've arrived here fresh, that they present something new and vital, and that manual arts training is something old and no longer essential. From that narrow view a rich history and depth of purpose may be missed. This being Earth Day brings part of that important story to mind. Woodworking in particular, working with very basic tools, as simple as a knife, can provide an intersection between personal creativity and the natural world that surrounds us and upon which we depend. In a maker space, the student is surrounded by manufactured materials and processes that tend to be far greater than arms length from the natural world. A simple way to think about Educational Sloyd, comparing it to the maker movement would be to think of organic and natural vs. inorganic and chock full of artificial ingredients. 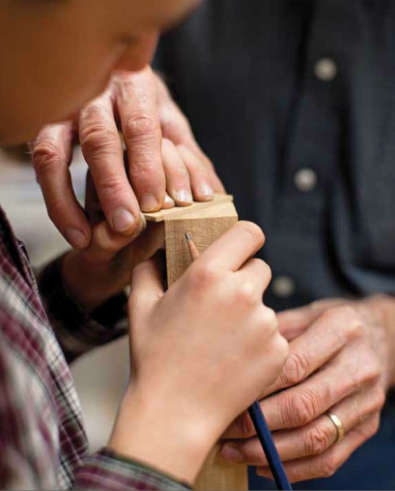 Woodworking is one of the ways that students engage in an exploration of materials drawn directly from the natural world. As children spend more time on the artifice presented by their high tech digital devices, an exploration of the natural world through the child's personal manipulation of natural materials and expressions of personal creativity are far more essential, not less so. My youngest students love to give me things, and the image above is what Joe called "organic wood." It has a nail carefully driven home at each end. Evidently, the term organic (for Joe) refers to wholesome materials, simple and pure to which no bad things have been done. Today, scientists are gathering in Washington, DC in a march for science. Some scientists have been concerned that speaking out will cause them to lose voice. The following is from the organizers of the march, with whom I agree. Donald Trump will no doubt celebrate Earth Day by removing more of the carefully crafted regulations designed to protect our environment. As we near the 100th day of his presidency, he can lay claim to having destroyed more of the regulations intended to protect the planet, and put more of the environment at risk than any other president to date. Happy Earth Day. May we all work toward living in a world in which no bad things have been done. I received an odd piece of mail yesterday. It was a request for sources for the brand of hinge that I reviewed in a recent issue of Fine Woodworking. But what made it odd was not the subject nor the sender, but that I received it at all. As you can see, it was addressed not to my address, but to my type of work. 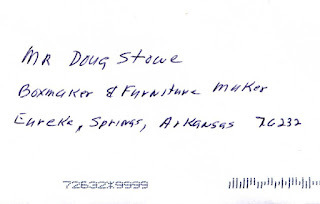 "Mr. Doug Stowe, Boxmaker and Furniture Maker" is not an address but an occupation. Where else but the small town of Eureka Springs, where I've lived for the past 40 plus years, would postal clerks actually deliver mail with such an insufficient address? 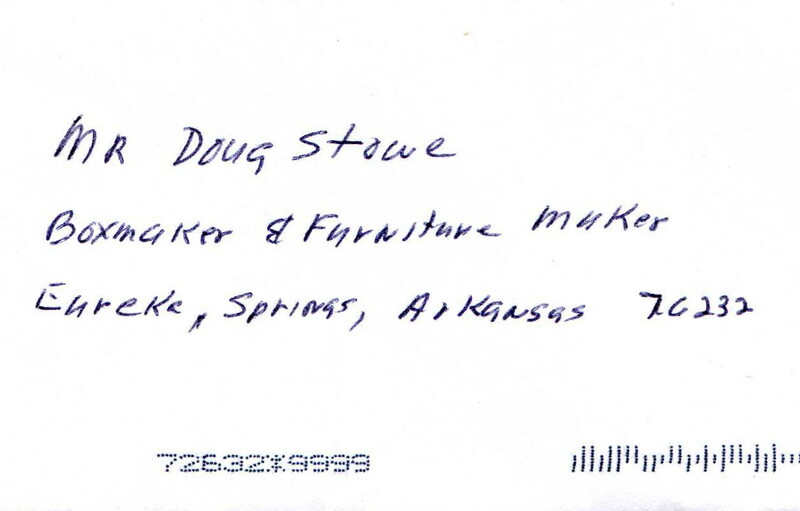 The envelope contained a stamped/self-addressed envelope, which is now on its way to an address in Indiana. I have written many times of the wonder of small town life. It may not be for everyone. Folks can get on each other's nerves. But when a piece of mail arrives in such an unexpected manner, it reminds me to feel a sense of belonging in this place. It is wise wherever you are to plant your feet and make an investment in community life. Make, fix, create, and increase the likelihood that others learn and grow likewise. 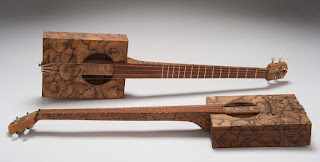 We are developing a gallery section for my box guitar book, and if any of my readers have favorite makers to suggest, please submit contact information to the comments section below. 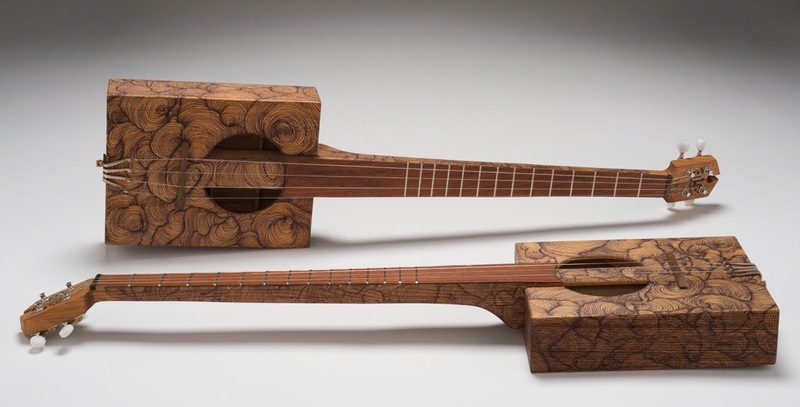 The book have a section in the gallery about Ed Stilley's guitars as well as work by another local maker, Ron Lutz. My emailed call for guitars brought an immediate result from an old friend Zeke Leonard whose guitars are lovely as you can see. In the meantime, progress continues on the new wood studio at ESSA, and shipping of the work benches will be today. 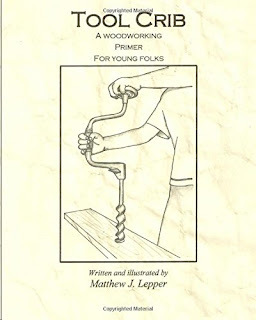 I was contacted by a man interested in starting a woodworking program who had read some old books about Sloyd and was surprised (it seemed) that we at the Clear Spring School are not following a model series. He wanted to know if I knew of anyplace in the world where Sloyd was being practiced as it was and as represented in the old books. No, I do not claim to be following Sloyd, but rather attempting to utilize the philosophy of Sloyd, outlined as follows. As with most models (sloyd itself is a model), there are problems that emerge when slavishly applied. Salomon saw sloyd as a "casting mold" from which better models would emerge. Or in other words, he saw it as a step in a process. But what happens in all models is that adherents adopt them as though they are the last word. Sloyd should be the first word, not the last. So starting with the interests of the child, what he knows, etc, the models or the 19th century are not necessarily what a child in the 21st wants to make. I could work to come up with my own model series that would be just as out of touch if I am truly attempting to consider and continuously reconsider the interests of the child. So my own teaching requires flexibility, some negotiation, and a lot of individual attention to each child. I've gotten requests from teachers who want me to share a “Clear Spring School woodworking curriculum.” I have a philosophy instead, that attempts to utilize the principles of Educational Sloyd. I am sorry if this philosophy does not give a clearer starting point for teachers interested in starting programs. The important part is to simply start. Just as the student will learn by observation, so does the teacher. Choose some very simple models of things your child would like to make, remembering that at first you and your child will know very little about what it takes, the skill involved, or the steps. For that starting point, some of the old Sloyd models from the books can be of clear use. Mike Mascelli, one of my fellow teachers at Marc Adams School of Woodworking, suggested that my students would love learning to sew. He suggested the Singer Model 20 as being the ideal machine to get them started. It was originally sold as a "toy" but one that does real sewing. My first, second and third grade students will start today. When one little girl saw the machine, her eyes lit up. "Doll clothes!" she exclaimed. Make, fix, and create. Help others to learn likewise. We call it K-12 education, but let's just re-number educational years 1-13 and leave the K out. The K was to stand for Kindergarten but Kindergarten is not what it once was, nor what it was intended to be, so to call it K is a misnomer and a lie. Kindergarten was a time of learning through play and through which a child was to embrace his or her wholeness within community, not to launch the children in a scheme of advancement through standardized tests. This article (one of hundreds about the death of Kindergarten) was sent to me by John Grossbohlin in New York: I've been in education for 20 years, and there's a disturbing trend afoot in kindergartens around the US. Giving children a chance to play and engage in hands-on learning activities helps them internalize new information as well as compare and contrast what they're learning with what they already know. It also provides them with the chance to interact with their peers in a more natural setting and to solve problems on their own. Lastly, it allows kindergartners to make sense of their emotional experiences in and out of school. So let's start being honest with ourselves. If we don't know what K was intended to mean by those who brought it to us in the first place, then we lie when we refer to K-12 education. Americans should make an effort to learn about Froebel and the invention of Kindergarten and stop making a lie of what he invented. If you know nothing about K, Norm Brosterman's book Inventing Kindergarten is a place you might begin your studies. If you want to do something about what you learn, consider my recent book, Making Classic Toys that Teach. 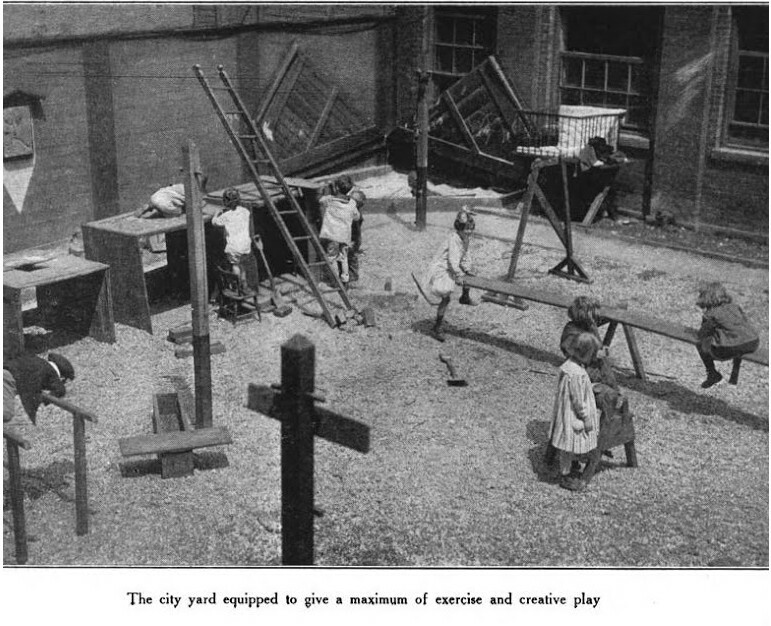 The image of play in a school yard is from 1918, a Catalog of Play Equipment. – Jean Lee Hunt. what works can also hurt. Educational theorist Yong Zhao, at the University of Kansas, noted the usually unstated matter of consequences. You do one thing, and there are serial effects. For instance, some reading programs may make students read better and hate reading. Was that the consequence we were most hoping for? In this article Zhao notes: What works can hurt: Side effects in Education. It appears to me that the problem that educational policy makers have is that they are too busy looking at the big picture and not at the individual child, or children and their specific circumstances and needs. A classic tale is of the philosophers walking along in the starlight, contemplating the mysteries of the universe. The tale was brought to an unhappy ending when they fell headlong into a drainage ditch. We do not know whether or not they drowned, but we do know that American education is drowning under the influence of standardized testing. Even the individual classroom teacher may be so focused on spreadsheets, work sheets and test scores that they may miss the needs of the individual child. Zhao notes, that if you were to buy a medicine, the requirements of law are that you be provided information concerning the possible side effects and unintended consequences, but that when it comes to our children and their educations, no such badly needed warning is supplied. We are to simply take the word of those who are selling us something, and that something may have disastrous effects. I can keep telling you about the Clear Spring School and the need for children to do real things. Do you mind? It will get easier for me and for all our children if you direct more folks to this blog. Together, we can put our children's hands to work, and wrest back their learning from the tyrants who, focused solely on standards have never witnessed the creative potential inherent in each and every one of our kids. In my home wood shop, I am working on products to fill an order for Appalachian Spring Galleries in Washington, DC. The Babe-Bot glue dispenser is my new best tool. Unlike the tiny squeeze glue bottles I've used for many years, the Babe-Bot is less likely to clog, and holds far more glue. You can see that it applies an evenly controlled line of glue, thus helping to avoid the mess that comes with too much glue. Unlike accordion style dispensers, it takes very little pressure to unsure a steady flow of glue, and the lid will not pop off when you least expect it. It is also easier to fill. Make, fix, create, and increase an understanding that we all learn best likewise. My tool chest is complete except for applying two coats of Danish Oil. I added a turn button to keep the drawer shut during transport, then a lift out tray and straps to keep the lid from opening too far. It is heavy and rather robust despite being made of thin wood but I am pleased with how it turned out. The type of construction used will make certain it lasts for generations. A friend asked how I can use such a lovely box for tools. "It will get beat up," he says. But what else could I use it for? Being made gives meaning to the maker. Being used and being useful gives meaning to the object. I marvel at how addictive the work of making useful things can be. On the day of Easter "Resurrection" as Christians are celebrating an important day of faith, the questions comes up, Were we "created in God's image?" as they say, or on the other hand, have we created our concept of God the creator in recognition of our own power? In either case, human beings when seen in their best light are creative. There is something magical or spiritual when we join in the process of creation. To make a tool chest is not quite as profound as making a flower, but human beings from our earliest days should be encouraged to make beautiful and useful things and to thus be of some service to family, community and self. The most interesting thing is that a man can spend a few minutes each day and in the course of a week, make a useful object that can last for a lifetime or more. In addition to work on the tool box, I've nearly completed my first large turned bowl from green wood. More sanding will be required, and as it dries, it will take a slight oval shape due to being turned from green wood. Make, fix, create, and increase the opportunity for others to learn likewise. One of my students, wanting to do something different, used dripping crayons to design the cover of his travel journal. Despite my concerns that it would not be done in time for their trip on Monday, the book is lovely as you can see. It reminds me of painting by Monet. He used a water based polyurethane to seal it, and I was surprised it would work over a wax based product. Last night we had dinner at the large table I had made for friends. The table set for eight is shown in the second image. Make, fix, create, and share a love of learning likewise. My cherry tool box is nearly complete. I added forged steel hardware with a rusted finish, as you can see in the photo. The turned shaker style knob may not fit the overall character of the box, yet. I expect the tool box to darken significantly in time to match the color of the knob. After this photo was taken, I added a turn button to lock the drawer so it does not slide open during transport, and I added a hand forged iron padlock that I purchased in a flea market in Stockholm in 2006. Today at the Clear Spring School, the last of my high school students will finish their travel journals, prior to their departure on Monday for Kansas City, Missouri, and then by train to Philadelphia. Yesterday at the Clear Spring School, we were visited by the head of our accreditation association, ISACS. Our first, second and third grade students were studying weight and balance using a balance scale in the classroom, and noticed that the new see saw that we'd made could be used the same way. They weighed two bean bag chairs using the see saw as their scale after first guessing which was heavier, the red or the blue. The red bag won, though the difference between them could have been no more than ounces, and the students and teacher, having carried the lesson outside on a beautiful day, will always remember more about weight and balance, as they were doing real things. Make, fix, create, and take greater part in the beauty that surrounds you. travel journals, and rusty new stuff. My high school students have been finishing their travel journals and will go to Kansas City on Monday and then go by train to Philadelphia for a week of study. Their hand made travel journals are an important part of preparation for this trip. Their journals reflect their own interests, and what they hope to get from their travels. Some will be kept for many years in remembrance of what they've learned. My first, second and third grade students have also become interested in making simple hand sewn books. What they see, they want to make for themselves. Today the head of ISACS will visit the Clear Spring School, and as you can see, hardware has arrived for completing my tool box. 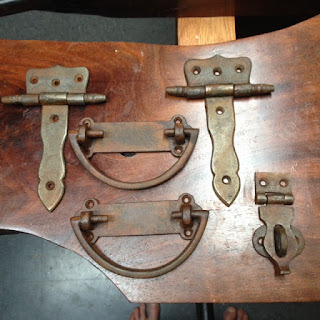 These simple, purposely rusted hinges, hasp and handles are made in India, but are very much like what one might have found made in an earlier day in the local blacksmith's shop. I applied a coat of paste wax to protect them from more rust, and to achieve a nice rusty brown color. Make, fix, create, and improve the chances of others learning likewise. The spigot remaining at center allows the use of a tail stock. Part of the teacher's challenge is to learn, so I am turning a large bowl from green maple. For those unfamiliar with woodworking terminology, green refers to the fact that it's still wet wood, freshly cut. The advantage of turning green wood is that the cells are full of water, and just as a ripe tomato is easy to cut with a knife and a dried tomato takes greater force, the bowl gouge cuts quickly through green wood. It leaves ribbons of pasta like strings of wood at my feet and hanging from my shoulders as I turn. The disadvantage of turning green wood is that as the bowl dries, it will no longer be perfectly round. As cells shrink in size due to loss of water content, and as the cell walls harden, the shape of the bowl will become oval. If I were to simply let the log from which this bowl came dry prior to turning, it would be severely cracked. So the strategy here is to leave the bowl shape thick enough that it can be turned again later after some of the distortion of shape from shrinkage takes place. Many skilled turners follow this strategy, turning in two stages, the first being wet, and the second, dry. Much of the wood turning art concerns how to hold material on the lathe while the gouges are used to form its shape. I formed a dovetail recess in the bottom of the bowl early in the process so it can be held by the lathe chuck. On the inside of the bowl I've left a spigot that allows a center in the tail stock to give strength to the mounting as the outside of the bowl is turned again to its final shape. Part of the mystery of turning is that there are always things that can go awry. The grip of the chuck can fail. The gouge, poorly controlled can catch and dig chunks from the wood. And while a bowl may seem like such a simple thing, a successful one, or even one that has come this far is not something to take for granted. Each and every second of turning takes intense attention. That is one reason turning wood on the lathe is good for kids. Each second matters. The effects of mindlessness become readily apparent. My thanks to Lin and Klaus for the lovely piece of wood. I have added a simple base to the tool chest that started out as a way to demonstrate the Woodhaven Portable Box Joint Jig. Today the hardware for the chest will arrive and when the lid is cut free from the body of the box I'll begin making a lift out tray using the same box joint technique. Repetition throughout the various components of an object is an important design tool that creates a sense of wholeness in the finished piece. The small cherry shaker styled knob shown in the photo is one that I made during photography for an article on turning knobs on the router table in the now defunct Woodwork Magazine for which I wrote as a contributing editor during the first years of the 21st century. We have gone for about a month now having caught no feral hogs in our trap. That's a good thing. The pernicious critters have at least learned that the trap and the area around our home are dangerous places to hang out. But the pigs are elsewhere in rapidly growing numbers and will be back in full force. The state legislature has established a "feral hog task force" for the eradication of feral hogs, but that means they will likely spend the next two years talking about the problem and doing little or nothing to resolve it. I want to direct my readers to this trailer of the History of Kindergarten project in which my own work with children will be a part. young woodworkers in Kress, Texas. The bed is made from cherry and the tailgate and tail lights of an old Chevy pickup truck. I'm sure Cooper could tell you the exact year of truck. The design is ingenious and won first place in the State of Texas ITE competition. The point, of course, is that students need the opportunity to do real things. There is a great deal of argument in the media about Betsy DeVos and her interest in giving parents choice by using a system of vouchers. When we begin to realize that children are people, too, and realize that we can trust their interests to lead them forward, it becomes no longer a matter of parents choosing what they think is best for their kids and sending them off to this school or the other based upon test scores. Some of what we know is that vouchers and "school choice" are no guarantee of student success. We can instead trust what Otto Salomon and the proponents of Educational Sloyd proposed in the 1800's. Start with the interests of the child. We can trust student interests to lead them forward. Parents and schools who recognize that their kids can be trusted to learn and then put the mechanisms in place to support student interests will offer greatest success. So instead of pushing a national strategy of vouchers and school choice, we should be adopting a national strategy of hands-on learning that allows students to do real things. That's something my cousin's grandson Cooper will be able to vouch for. Congratulations to Cooper, and to a school, Kress High, in Kress, Texas, that has retained a program that allows students to do real things developing their own skills and using their own imaginations. Making a cherry tool chest. Yesterday I went to an open house for prospective A+ Schools fellows. It was held at the Thea Foundation headquarters in Little Rock. The idea of A+ Schools is to put the arts back in schools, and it is my hope that Clear Spring School and our staff can help. A+ and the Thea Foundation are attempting to do on a large scale what Clear Spring School has done for years. They became interested in my participation because they know that wood working belongs in all schools. I also assembled the drawer for a cherry tool box that I'm making to test and demonstrate the Woodhaven Portable Box Joint Jig. I used the jig to make the box joints joining the sides of the box, and the joints at the back of the drawer. I used cherry slides to support the drawer in the cherry case and will strengthen the construction by adding a base. There is a problem with jigs that allow things to be so quickly made. In a day or so, I can make an object that if cared for will last a lifetime, and I could get carried away by too easily making too much stuff in a world that is already overrun with too much stuff. I expect this tool chest to be useful when I travel or teach, and it will be used to organize some of the small objects and supplies that take up space on shelves in my finish room. When it no longer serves, it can be composted with no ill effects on the environment. I have ordered rustic steel handles, hinges and a hasp. The drawer will have a hand turned pull, and I'll use turn buttons to lock the drawer closed for transport. Make, fix, create and prove that others can learn likewise. Scott Bultman sent me a couple books and a DVD about folding a circle by Bradford Hansen-Smith. Hansen-Smith uses common paper plates to create incredible artistic and mathematical models grown in astounding complexity. If you were to study mathematics in school, you would wrongly assume it is about numbers and miss the wonders of it all that become apparent when the hands are engaged in doing real things having to do with proportion and scale. "Geometry and spatial sense are fundamental components of mathematics education. They offer ways to interpret and reflect on our physical environment through abstraction. They support creative thought in all mathematics." The Paradise of Childhood describing the gifts and occupations of Kindergarten showed the use of circles of paper folded as an exercise in the development of mind, and just as Froebel was interested in the development of the whole child and his or her relationship to the whole of nature and the whole of humanity, the study of circles and how you can fold them can lead you in a more creative direction. Everyone brings to the circle their own experience, observations, making connections from which to explore and discover, even 5 and 6 year olds. Anyone that an fold a circle in half is capable of doing this. 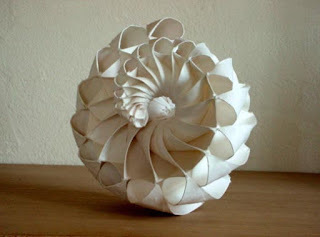 The value of folding circles is in the individual experience and the connections one makes to math, art and in all other things we do and think about. Book making is a valuable learning exercise and I was pleased that some of my students in high school remembered the book making they had done with me in upper elementary and middle school wood shop years ago. That gave them a leg up on getting started today. The idea is that of creating a travel journal jam packed with text, images and other souvenirs gathered when they go to Philadelphia in just over a week. The students are required to write about the experience. These handcrafted journals will have memories packed inside. The making of journals is part of this year's trip preparation process. The hands embed memories into the materials they have crafted. Today my students begin designing their covers. I have prepared Baltic birch cover boards that they can decorate and personalize in a variety of ways, using milk paints, veneers, metal stamps and hot melt glue. When those are complete, the books can be assembled. These are real bound books using a binding technique taught to me by book artist Dolph Smith. While the iPhone seems to dominate every situation, we hope to prove that there is still a safe place in the scheme of things for a old-fashioned, hand made book. If my students' enthusiasm for this project is any measure of our future, it appears to be in good hands. My blog, boxmaking101.blogspot.com shows box making progress in my own woodshop where I am making a tool box to test and demonstrate the use of a Woodhaven Portable Box Joint Jig. Yesterday my upper elementary school students and I finished a seesaw they had asked to make me to help them make. Upon completion, they devised a set of rules for its safe use, submitted them to the head of school for approval, and will this morning present the new seesaw to the rest of the school. It is a rickety, make do contraption, very much like those made by children nearly a hundred years ago. A lovely book is offered free on Google Play, a Catalog of Play Equipment by Jean Lee Hunt, 1918. This book would send an OSHA inspector into conniption fits. Out of door furnishings should be of a kind to encourage creative play as well as to give exercise. 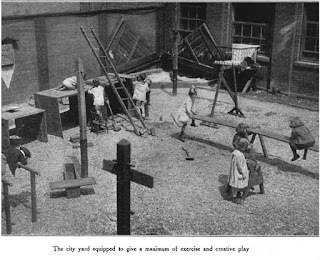 Playground apparatus, therefore, in addition to providing for big muscle development should combine the following requisites: Intrinsic value as a toy or plaything. "The play of children on it and with it must be spontaneous." Adaptability to different kinds of play and exercise. "It must appeal to the imagination of the child so strongly that new forms of use must be constantly found by the child himself in using it." Adaptability to individual or group use. In my shop I am in the process of making a cherry tool box that began as a test of a Woodhaven Portable Box Joint Jig. I will sand the insides of the tool box today and begin assembly. The jig worked great, and will be the subject of a review I'll write for Fine Woodworking Magazine. Make, fix, and create. Insure that others have the same opportunities. 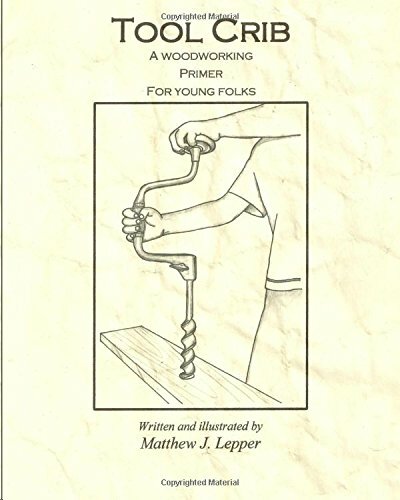 A dad in Clever, Missouri sent me copies of his book Tool Crib, A woodworking Primer for Young Folks. It is written in rhyme, and with simple illustrations is intended to give kids the encouragement they need to begin woodworking. Today I will introduce my high school students at Clear Spring School to book binding. The plan is that they make their own travel journals. Make, fix, create, and offer the joys of learning to new generations. One of the features of the Woodworkers Showcase is their annual toy shop in which children are helped to use hammers in making small boxes and toy cars. It may surprise some to watch children 7 to 15 years old who have never driven a nail, or assembled something themselves. We have adults these days in the same situation, having never driven a nail, and wonder why we have a persistent unemployment problem and have to acquire so much skilled labor from overseas. OK, let's get real. Politicians claim that we have problems with our educational system that they can fix with vouchers that allow "school choice." The real solution is in allowing children the choice of learning by doing real things. Children have a natural interest in doing real things that are of benefit to their families, communities and themselves. We are safe therefore in designing schools that follow the guidelines of Kindergarten and Educational Sloyd. Start with the interests of the child. Assist the child from moving from the known to the unknown, from the easy to the more difficult, from the simple to the complex and from the concrete to the abstract. I can, however, repeat that until the cows come home, and educational policy makers, eyes glued to test scores on their abstract digital devices may never choose to understand. Today I am unpacking from my travels and gathering materials for book making at Clear Spring School. Make, fix, create, and make these three words, the centerpoint of modern schooling. I just returned from Saratoga Springs, New York, and should mention the event that shares the time and venue of the Saratoga Springs Town Center Convention facility with Woodworker's Showcase, Totally Turning. That event draws wood turners from all over the east coast and southern Canada, so in addition to sharing my work and my books with woodworkers, I had the chance to rub shoulders with wood turners as well. Their work on display was amazing. One wing of the convention center was dedicated to wood turning and turners had come from far and wide. The turned pieces shown in the photo were granted a first place award by the Northeastern Woodworking Association. Today I was back in the classroom at the Clear Spring School. I return home to Arkansas this evening after a successful showcase. I have two classes today and then go to Albany for the first of my flights home. It is a pleasure to spend time with fellow woodworkers. It is a worry that so many of the participants are of the same age. Woodworkers are often in their 50's, 60's, 70's and above, and the idea of woodworking in schools seems to have been eclipsed by robotics. That means that if we want our children to be as smart as we need them to be, we'll just have to take matters and materials into our own hands. Let's teach our children well. The Northeastern Woodworking Association sponsors a toy making event at the show in the hopes of luring families and children into the joys of creating wonderful things from wood. But still, there seems to be a lack of children at the event. My own presentations have been on Tiny Boxes and Making Classic Toys that Teach. Each is based on a recent book. Both have turned out to be interesting subjects. As we look around and see so few children and young adults in the audience, we know that making lovely things for our kids and with our kids that impart wisdom is required. I have been meeting a few blog readers and it is a very good thing to meet face to face. As jurors for the show we selected a rather unusual best of show award. Normally the award is granted to a furniture piece. We chose instead an Adirondack guide boat. It is a lovely and useful thing. Close up one finds that it's meticulously crafted. Make, fix, create, and grant others the opportunity to learn likewise. I am at Woodworker's Showcase in Saratoga Springs, New York, and along with my fellow jurors, examined a great deal of fine work from wood. My personal choice as best of show is a hand-crafted Adirondack guide boat. I think my readers understand my own love of wooden boats. Fellow jurors, Ernie Conover, Bob Van Dyke and Freddy Roman had the same feeling about the quality of the boat and we came to a quick agreement. Best of Show. Photos will come tomorrow. Today I will have two classes. The big sphere in the Albany airport is appropriate to one of my presentations, today, Making Classic Toys that Teach. Make, fix, create, and provide the opportunity for others to learn likewise.